Eskdale Campsite Lake District – What Camping Pods Are REALLY Like (+ Campsite Review)? 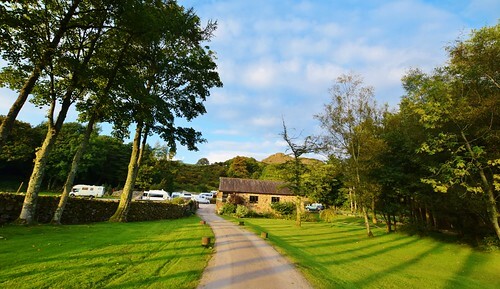 Eskdale Campsite is situated in the beautiful Lake District in the UK. The campsite has options for tents, campervans and also has a large secluded section for camping pods! I spent two nights at Eskdale campsite in one of their 10 camping pods. Now becoming more popular and with limited options for camping pods in the Lake District, this was time to see what Eskdale camping pods were like. The campsite is a great location, it’s close to England’s highest mountain Scafell Pike, it was great for me. Mainly because I wanted to take on the challenge of climbing to the top! 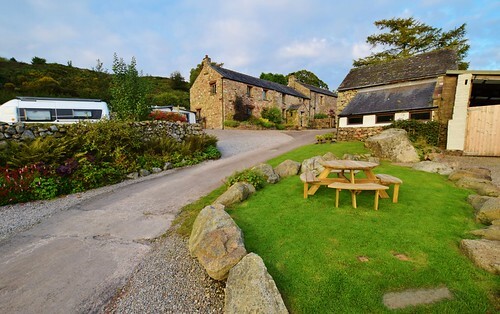 Eskdale campsite is located in Boot in the west of Lake District National Park. There are beautiful views (on a good day) of the hills around including the Scafell mountain range. To drive to Wasdale Head (a great starting point to climb Scafell Pike) it’s around 40-minute drive. What Camping Options are there at Eskdale? Eskdale Campsite is open from 1st March to 14th January. Owned by Martyn & Sara, Eskdale Campsite is in a beautiful spot in the Lake District. And the perfect getaway from the hustle and bustle of busy life. One factor you can take as a positive or a negative is that there’s pretty much no phone signal. So it means you can really have an almost technology free break. In case you do need your Facebook fix, the campsite has free Wi-Fi in the reception. For the camping pods, there is also free Wi-fi. It’s not perfect, but it does mean you can upload photos and messages of your adventure. In emergencies, there is also a payphone available. I arrived, without the help of my sat nav again. Why does it always try to drive past where I am going I have no idea! Anyway, Eskdale Campsite has a big sign so luckily I spotted that and turned up the little driveway to the main building. 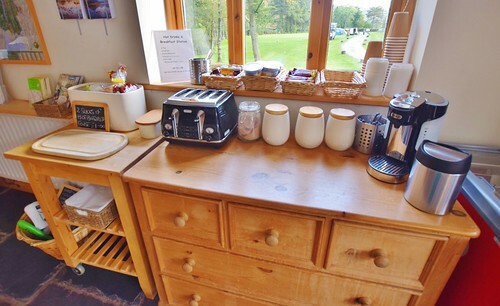 Reception is part of the small shop, which has everything you could ever need (or have forgotten!) I’m given my camping pod key, a little gas heater and shown around the facilities. The lady then shows me an even closer place to park around the back of the building. Very handy for me as I seem to have a ridiculous amount of camping gear. The Camping Pods are split into 2 groups, one with 4 and one with 6. All facing inwards towards a picnic bench area. It feels like this would be a really nice social area during the summer months when it’s busier. I had one neighbour so good to chat with someone whilst cooking my dinner! Inside the pod it’s basic, there are a few hooks and a roller blind to go over the double doors. One thing I loved about the Camping Pod is that you have loads of space to spread out inside. I know it was only me, but seriously I had so much stuff. The undercover porch area is very handy too. I could keep all my cooking equipment outside. 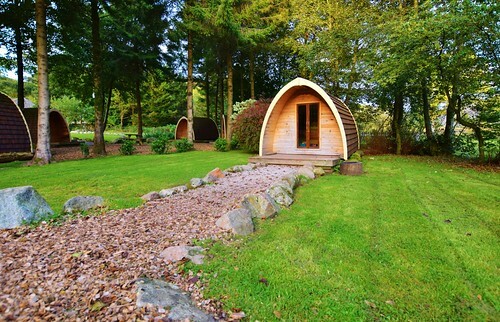 These Lake District Camping Pods were the first ones in England and are now 9 years old. They have a rustic feel to them and by that, I don’t mean old haha. There’s green moss growing on the roof. And there are logs around the outside which are also covered in moss. I do love my moss!! And with gravel paths around leading to each pod, it’s easy to find your way at night too. You might like to read Can you name all 15 National Parks in the UK? Bring a camping box with a lid then you can leave it outside all the time. Even with the porch, I am sure that British sideways rain could easily sneak under! Remember to bring a comfy mattress and a sleeping bag. It’s a camping pod, not a Tardis, there’s no luxury bed, bathroom or sofa inside. I’d also recommend a good light/torch. The pod is great for sleeping because it’s so dark. But trying to find anything after dark is pretty hard. I might have got over excited about one thing at Eskdale campsite. And that’s the drying room. Every walker or cyclist knows that when camping the worst thing is getting soaked and having no-where to dry your clothes and boots. The drying room is huge and it’s hot, pretty much all you want from a drying room. They have laundry facilities, with a washing machine I couldn’t figure out. Martyn had offered to help me but I was like how hard can it be! So after 2 weeks on the road, I washed all my smelly clothes and hung them to dry in the drying room. 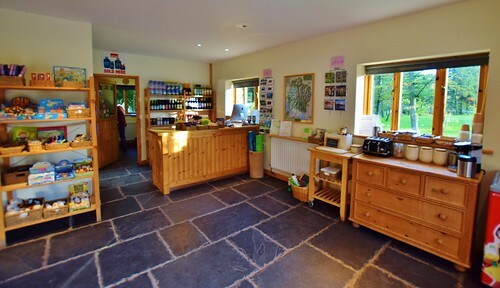 Eskdale Campsite also has a lovely little shop with a small selection of fresh and dried food. Plus every camping item that you might need to make your camping pod cosy. Including gas for cooking, camping mattresses, dog food and games to keep the kids entertained. They even have a small selection of gifts which is great if you need to buy a present for someone. Showers are located within the main building. There are 3 in the female washrooms. I guess the same for the men, you’ll be pleased to know I didn’t check! And the all-important hairdryer, very handy for me as my hair is really long. I wouldn’t have bothered washing it if there wasn’t one as I don’t like to be cold! Yep, that’s me, warmth before style I’m afraid! Eskdale Campsite in the Lake District is a friendly and well-run campsite. I love the little touches like the breakfast station in the shop. At first, I was thinking doesn’t everyone bring their own food. But the guys in the pod next to me had come away on a spur of the moment trip and pretty much had nothing with them. So I saw them enjoying toast and a cup of tea in the morning. All items are £1 and you help yourself, a great idea. The camping pods at Eskdale are great for camping out of season or if you don’t want to buy a tent just yet and test out whether you like the outdoor camping experience. Since the Lake District is popular with tourists and locals be sure to book your camping pods early. Since you’re in the middle of the Lake District there are some lovely walks direct from the campsite. On my second day, I walked 7 miles to nearby Ravenglass. And then treated myself to a ride on the steam train back to Dalegarth. Less than 5 minutes walk from the campsite. Read more about my challenge here: Ultimate UK Road Trip & Hiking Challenge. Follow me on Facebook for more posts! *I was a guest at Eskdale Campsite Lake District. However, all views and opinions regarding my Camping Pod stay are my own.